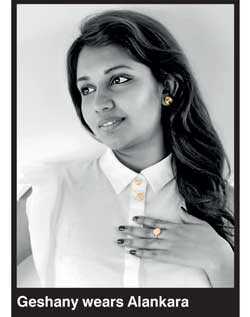 In another example of serendipitous creative collaboration, leading jeweller Alankara and local artist Geshany Balder joined hands to launch Alankara’s latest offering – an exquisite new collection called “Dawn To Dusk”. 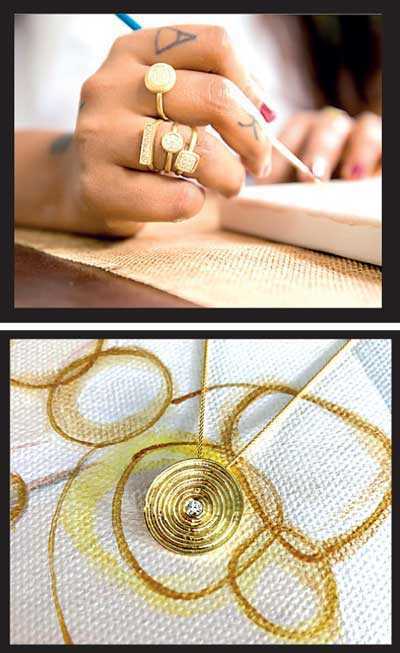 The renowned jewellery brand is committed to promoting local artists in Sri Lanka, by including their art in display units at the flagship Alankara shop at Odel in Colombo 7.This alternative exhibition space creates a new ‘everyday’ audience for up-and-coming artists like Geshany. The Dawn to Dusk collection is made exclusively in gold and diamonds, and features uniquely designed pendants, earrings and rings. As the name suggests, the pieces are designed to be worn throughout the day, and into the night, holding their own at any hour, with any attire and on any occasion. Sri Lankan born Geshany has family roots in Germany and studied art in both Europe and Asia. She bases her work on neo-surrealism, seeking to distort the elements of time and space and explore what lies beyond our everyday reality. Examining the unknown and delving into both interstellar and inter-dimensional worlds; Geshany also includes mythical characters in her art. Explore more of Geshany’s current art projects through her Instagram page - @geshany_balder. To see the Dawn To Dusk collection, or learn more about Alankara’s exquisite jewelry and design philosophy, visit their Facebook page - www.facebook.com/AlankaraJewelry.